Package design involves designing "mechanicals" which are flat artwork with trim lines and specifications such as folds, varnishes, drill holes, etc. In case you aren't familiar, I'll use the next two portfolio samples to introduce you to the process. Mechanicals are what specify everything to the factory printing and producing the packaging. You can see die-lines, fold lines, measurements, color specs, and more. The factory worker will use these as instructions, then remove the specs and produce the finished pieces. Sometimes mechanicals don't visually represent the finished piece. For example, on an earlier design in the background, the yellow represents a silver metallic thermography ink and the magenta a gloss varnish. 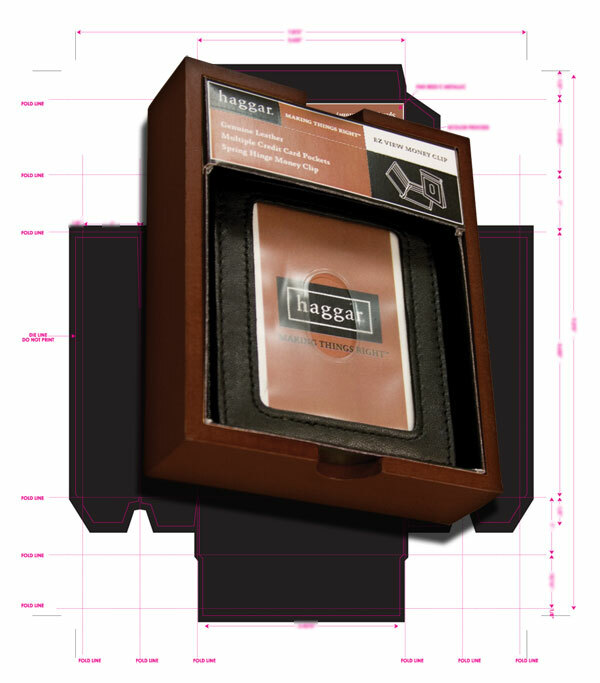 Concept boards are created to show a visual representation of what the finished packaging should look like. These are sometimes necessary for presentations before approval to go ahead with production. To the left, you can see the Ali Miles hangtag, care label, interior woven label, and button envelope. All of which were initially created as mechanicals. This mechanical is for what is called a matchbook. It is attached to the waist of slacks with plastic swift tacks. As with all mechanicals, it contains all of the specs the printing factory needs to produce the finished piece. This mechanical is for a 3D Point of Sale or Point of Purchase type of display. I simply refer to it as a shelf filler--it filled the entire space between two shelves. These were used in Canada, so there was an English version and French version. This mechanical design was created to hold reading glasses. It was essentially a simple measuring and prototyping exercise to develop the exact dimensions that would hold different types of glasses without being too loose or tight. This mechanical concept was created to hold three golf tees that would come free with the shirt. Several designs were prototyped and this proved the most durable. The magenta lines represent folds and the holes are drilling or punching locations. The most complicated design I've ever worked on was a wallet box made up of several pieces. Measurements were taken from a pre-existing wooden box and wallet, and the individual pieces were created and prototyped. 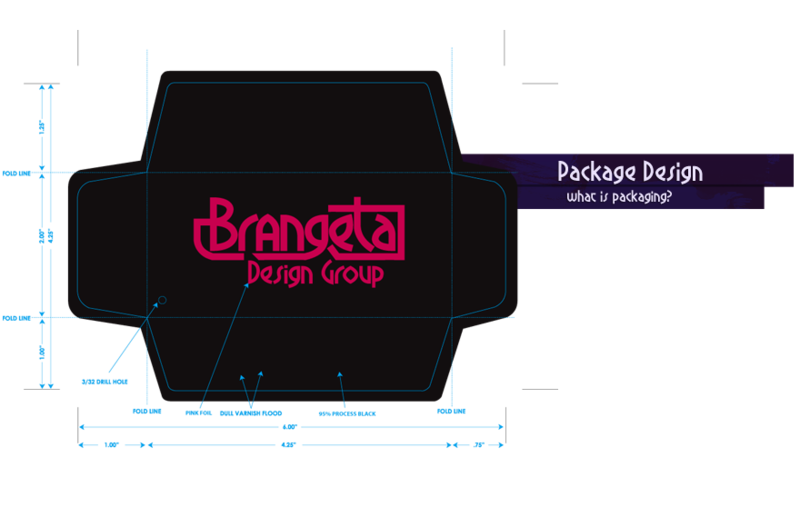 Represented to the left are the four pieces required to create the packaging. To see the finished prototype on top of one of the mechanicals, click here. I created and worked on perhaps hundreds of different pocket flashers for Haggar and their other brands. Pocket flashers were attached to the rear pocket of pants using plastic swift tacks. Several examples are shown on the left. One of the prettiest packaging designs I worked on was for a (then) new brand named Y. The logo was created by Adam Hallmark and I designed the rest. The cyan (blue) represents a high gloss varnish and the green color was a metallic seafoam.